He is India’s very own homespun celebrity chef. 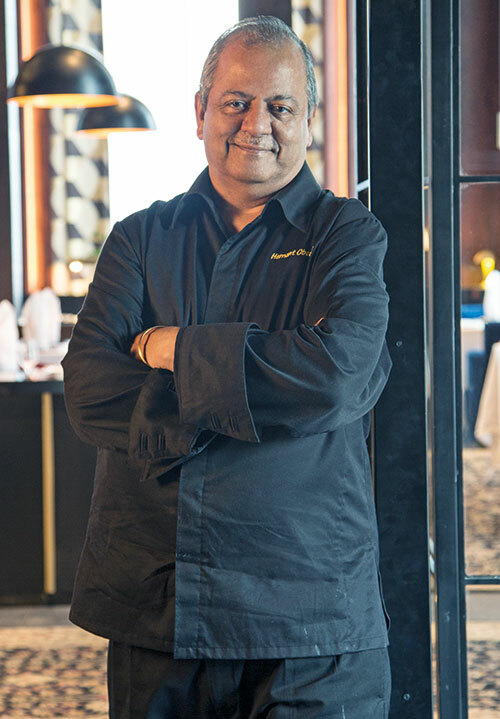 Forty-one years with the Taj group of hotels, one hundred restaurants…it has been a formidable career indeed! Hemant Oberoi has cooked for royalty, politicians, international bigwigs, industrialists, beauty queens, socialites…you name it. So, it was indeed a landmark moment, recently, when the chef launched his own restaurant, named eponymously, at Mumbai’s BKC. The interiors of the city’s latest eatery reflect Oberoi’s cuisine in a sense — classical and rooted in traditional European techniques and yet contemporary in outlook. The high ceilings, wood-clad walls and wooden pillars are inspired by European dining rooms of yore while an interesting central chandelier created by young local artist, Shailesh Rajput, red-glass-topped dining tables and mismatched chairs add to the modern vibe. Oberoi intently watches my reactions as I taste his delectable fare. He is one chef who has mastered modern vegetarian food; and a selection of starters freshen the palate on this hot day. The first course, a salad, is a medley of green, yellow, black and red tomatoes with mouth-popping tomato ‘jellos’ camouflaged within and with a tomato sorbet on the side. This is followed by a three-melon cold soup served with much drama, with smoke rising and liquid pouring. The highlight is a version of the camembert dariole that he made famous at the erstwhile Zodiac Grill; a brie and truffle version served with brioche. A portion of mushroom cannelloni is presented by a white-gloved server, and I find it to be nutty in flavour and piping hot. The non-vegetarian mains include sea bass perfectly cooked, placed on a bed of spinach and topped with some Peruvian chillies. Delicious! And a leg of lamb tender to the point of perfection, replete with the taste of Peru. 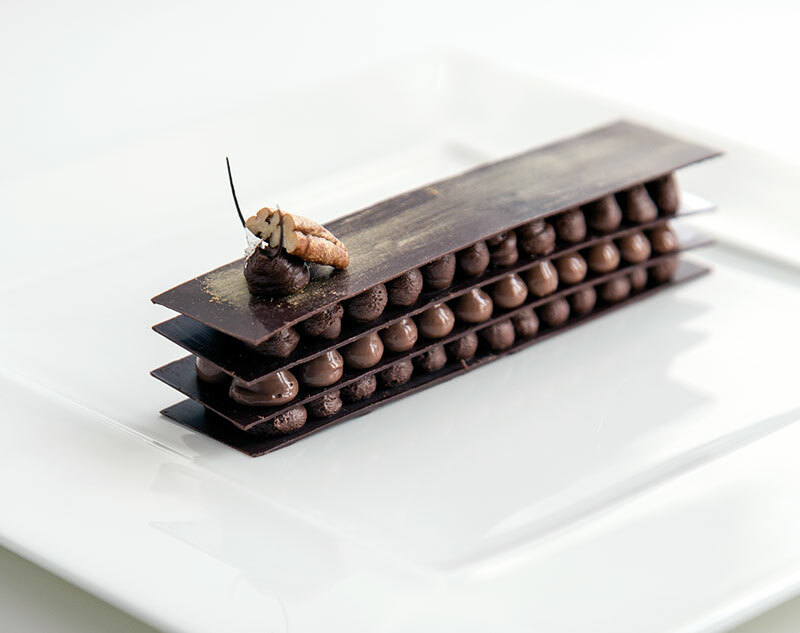 The dessert is a chocolate mille-feuille where the layers are crisp, the ganache melt-in-the-mouth and the whole a satisfying end. What has your recent journey been like? I left the Taj in 2015 and stayed as a consultant until April 2016. Last May, I opened a restaurant in Singapore, which serves refined Indian food, called Yantra. I moved for a while to San Diego where my younger son lives, and opened Masala Street, which he now runs. Last November, I signed up for this place (Hemant Oberoi, the restaurant) and was determined to launch it within a few months. This is special since Mumbai is my hometown after all. What can diners expect at Hemant Oberoi, the restaurant? As far as the decor goes, my brief to architect Ashiesh Shah was that it should look like a 19th-century French or British dining room and yet be modern. Regarding the food, the essence of my cuisine is classical. We do not do molecular; we finished with that 15 years ago. I would call it ‘refined dining’ or ‘redefined food’. People want something different and I have always managed to stay ahead of the trends to be able to give them that. Zodiac Grill was ahead of its time; we served lighter Indian cuisine for the first time at Masala Kraft; and introduced Vietnamese food to Delhi and Bengaluru. Here, we serve dishes inspired by European and Peruvian cuisine. You have launched a hundred restaurants — what has been your success mantra? I think it’s sincerity to the food and the customer. People have passion but you also have to be totally loyal to both! If you are fighting with your wife, you can never create good food. You have to be in this a 100 per cent or not at all. Also, the personal touch is essential as well as constant innovation. Have you used any unusual ingredients? I have brought a Peruvian touch to the menu, having spent 45 days in that country. I use quinoa and avocados, ingredients that originally came from Peru. I brought back the seeds of their chillies and gave them to a farmer in Bengaluru to grow. I’ve also brought back Peruvian corn. Who would you consider to be some of the fans of your cuisine? We’ve been open just a week but the news has spread mainly by word of mouth. Sachin Tendulkar has been here already; as have Harsh Goenka, Alia Bhatt, Shilpa Shetty, Ajay Kanoria, amongst others. I am sure that the foodies in Bollywood like Rishi Kapoor will come soon. And Mukesh and Nita Ambani once the IPL is over. I do not want to open restaurants for the sake of it; I’d rather create quality establishments. It is difficult to find the true essence of Indian food outside India and I’m trying to introduce this in several places. I have spent the last two years thinking about how to present food in a different way. I recently took four of my chefs to Dubai to experience some of the finest restaurants and expose them to the true luxury that I want translated into my food.